Carnelian is a member of the agate family. It is a stunning fiery red/orange. Carnelian has been used since ancient times for jewelry. Egyptians believed carnelian amulets would ensure the soul's passage into the afterlife. It is also the gemstone of the Hebrew tribe of Reuben and of the apostle Philip. Ancient Greeks and Romans called carnelian "sardius" and used it for signet rings, cameos and intaglios. It is believed to add pep to your life and give a sense of humor. Chalcedony (kal-SEH-doh-nee) is the common name for the micro- or cryptocrystalline branch of the quartz family. This branch of the quartz family includes agate, jasper, carnelian, chrysoprase, onyx, aventurine and petrified wood. 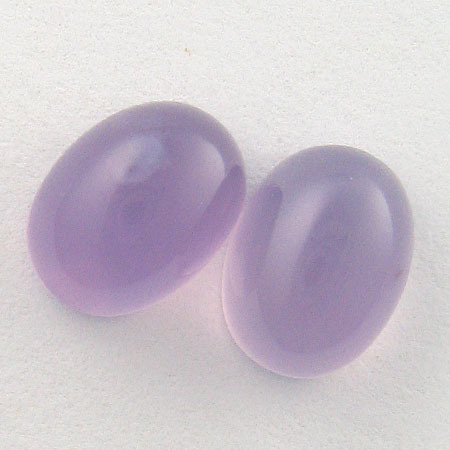 In broad terms, chalcedonies can be semi-transparent, translucent, solid or patterned. The most common forms of chalcedony are agate and jasper. In the gem and jewelry trade when someone refers to chalcedony, they are usually talking about a semi-transparent or translucent stone with a solid color (most often soft blue) and a waxy luster. 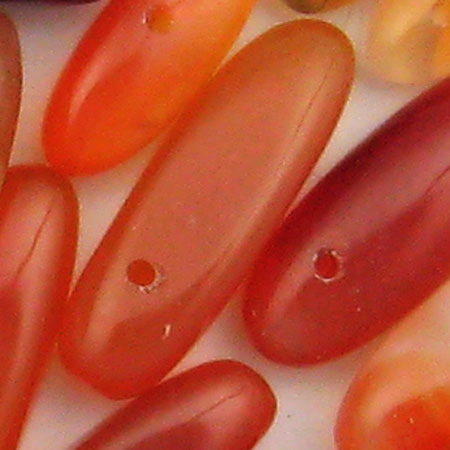 This type of chalcedony can also be white, purple, pink, yellow, orange or red (but not orange-red which is referred to as carnelian). Chalcedony is very porous so light-colored chalcedony can be dyed almost any color. It may be dyed to resemble other gemstones, such as lapis, or to resemble other less common members of its own family such as chrysoprase. A unique characteristic of chalcedony is its ability to be a pseudomorph. A pseudomorph is a mineral or mineral compound that is replaced, atom-by-atom, with another without changing the original mineral’s external appearance. Examples include petrified palm wood, the Petrified Forest National Park in Arizona, and dinosaur bone. In ancient times, chalcedony was used as a talisman against idiocy and depression. Today, it is still believed to banish depression and mental illness; fear and hysteria. Chalcedony is also thought to stimulate creativity, calm and peace. Care: Chalcedony is not quite as dense or as hard as other quartzes, so protect it from scratches, sharp blows, harsh chemicals and extreme temperatures. Clean with mild dish soap; use a soft toothbrush to scrub behind the stone where dust and dirt can gather. Chrysocolla is a beautiful blue-green stone and can be found wherever there are large deposits of copper. It can often be found intermingled with malachite, turquoise and azurite, creating a wonderful mixed gemstone known as eilat stone. The name chrysocolla comes from the Greek words chrysos, meaning gold, and kola, meaning glue, referencing the fact that chrysocolla was employed from the earliest times by goldsmiths as an ingredient for solder, called santerna by the Romans, to weld gold pieces together. Renaissance painters used ground chrysocolla as a pigment for their paints. Chrysocolla is believed to stabilize rocky relationships. It is thought to encourage self-awareness and inner balance. 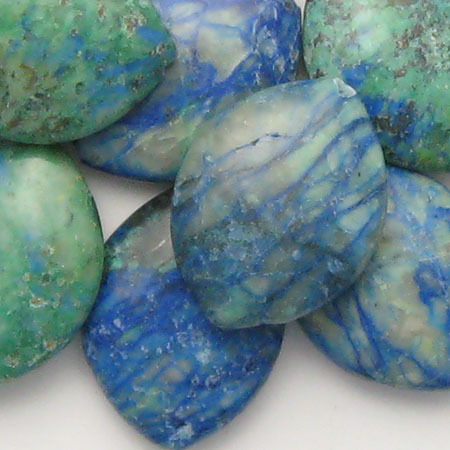 Chrysocolla is also said to relieve arthritic pain. Care: Chrysocolla is a relatively soft gemstone. So store it away from items that may scratch it. Avoid household chemicals and prolonged exposure to excessive heat. Do not clean chrysocolla in steam or ultrasonic cleaners. Instead, use warm soapy water and a soft cloth. Citrine is a form of quartz and ranges in color from pale yellow to a sherry red. 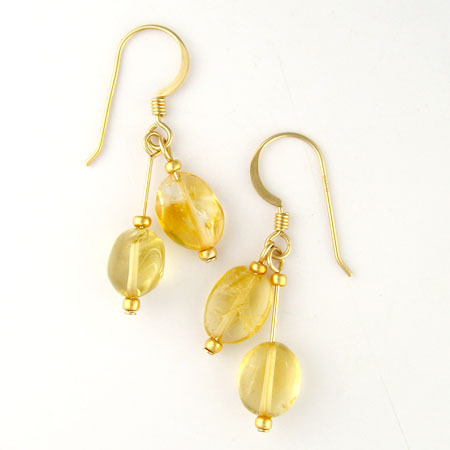 The name, citrine, comes from "citron" the French word for lemon. While citrine does occur naturally, the majority of citrine in the marketplace is actually heat-treated amethyst - purple amethyst that has been placed in a kiln and heated at a certain temperature until it turns into yellow citrine. Citrine is said to increase self-esteem, open the mind to new thoughts, and promote clarity of thought. It is also known as the lucky "Merchant Stone" - place one in your cash draw and what sales increase. Normal or plain which is simply copper wire coated with a beautiful tarnish-resistant color. Silver-plated which is copper wire that is first silver-plated and then coated with a color. The silver-plating gives an added sheen and depth to a color. And, of course, is more expensive. ​Regardless of whether the wire is first silver-plated or not, the coating is permanent and resistant to scratches, chipping and peeling. I love the way it makes up into fun earrings, rings and bracelets. 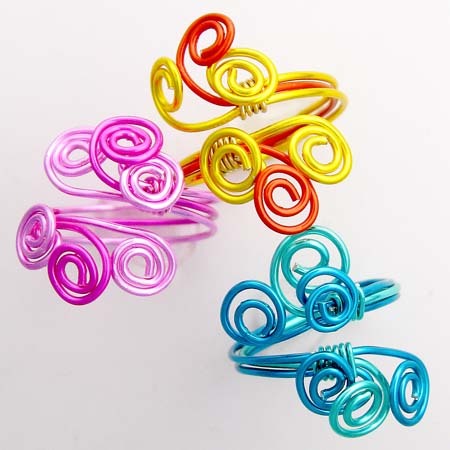 With a little care, jewelry made of colored copper wire will retain it's bright color and shine. If a piece does look a little dull, simply wipe it with a soft, damp cloth. Do not use any type of metal polish or cleaning solution. Avoid bringing colored copper wire in contact with rough surfaces or sharp objects which could damage the finish. Copper is one of the oldest metals in use. It has long been used to make tools and pipe as well as jewelry. When highly polished it has even been used as a mirror. Copper's soft reddish orange color makes it the perfect accent for red, brown, black and turquoise colored gemstones and beads. Unless it is protected it will darken and patina or oxidize as it reacts with air and humidity. I use thin coats of Renaissance Wax on all my copper jewelry. The wax is transparent, letting the beauty of the copper show, while retarding tarnish. As with all coatings, the wax will wear off after prolonged use. Any oxidation can be removed with a silver polishing cloth. Copper is used in healing rights by many peoples of the world. 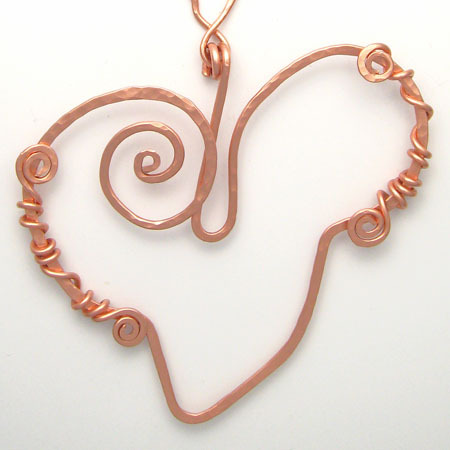 It is believed copper helps relieve the pain of arthritis and rheumatism. It is also thought to help overcome exhaustion. The mineral corundum is best known for its gem varieties, ruby and sapphire. Ruby and sapphire are scientifically the same mineral but just different colors. Ruby is the red variety, and sapphire is the variety that encompasses all other colors, although the most popular and valued color of sapphire is blue. Sapphire is also only used to describe the gem variety; otherwise the mineral is simply called corundum. Corundum that is not gem-quality is made into grinding wheels and discs, emery paper, and powders for grinding and polishing. 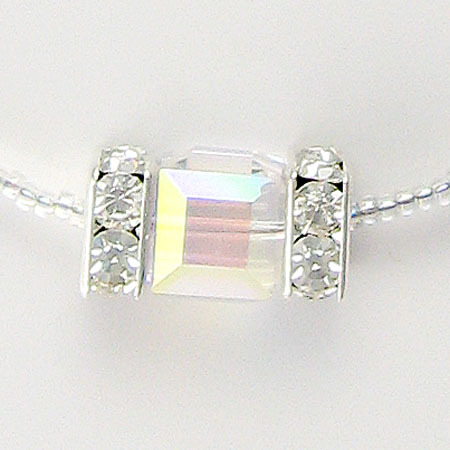 Originally the word "crystal" referred to a colorless, transparent mineral now known as rock crystal quartz. Today, crystal generally means top quality glass made of a compound of sand, sodium potassium carbonate and other materials melted at high temperatures. The addition of lead oxide to the molten glass increases its weight, clarity and refraction (sparkle). In about 1673, George Ravenscroft, a London glassmaker, patented the process of making lead crystal. At about the same time the process of cutting designs into glass became prevalent. The increased sparkle of lead crystal made it the perfect medium for glass cutters. Government taxes on glass in England, caused many manufacturers to move to Ireland. When the Irish began taxing glass, the industry died. However, glass manufactures in Bohemia (now the Czech Republic), France (Baccarat), Sweden (Orrefors) and Austria (Swarovski) flourished throughout the 1800's. The glass industry in Ireland (Waterford) was revived after World War II. Each of the manufacturers has their own formula for creating lead crystal. In recent times, many of these glass houses have developed new, lead-free crystal which has the same sparkle and brilliance as leaded crystal. Daniel Swarovski, founder of Swarovski, learned the art of glass-cutting from his father who owned a small glass factory in Northern Bohemia (now part of the Czech Republic). In 1892, Daniel Swarovski patented an electric machine that facilitated the cutting and polishing of crystal. His machine revolutionized glass-cutting, ensured consistent, high quality, and increased production. In 1895, the company moved to Wattens, Tyrol in Austria (where it remains today) to take advantage of local hydro-electricity for the energy-intensive processes Daniel Swarovski patented. The company is still family-owned and is now run by the 5th generation. In 1965, Swarovski began working with the fine jewelry industry. The company partnered with Christian Dior to create the Aurora Borealis (AB) effect which adds an iridescent finish to crystals. Since September, 2012 Swarovski has been producing lead-free crystal which meets current environmental standards. Made in Bohemia where glassmaking has been a tradition for over two centuries, Czech glass beads come in a wide variety of colors and shapes and are considered among the best available. 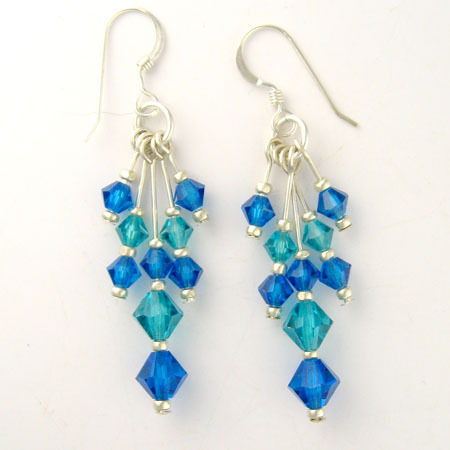 Czech glass beads that are faceted and then fire-polished rival the sparkle of lead crystal. In addition to the many colors of glass, the beads may also have special coatings or finishes. One of the most popular is Aurora Borealis (AB). This highly iridescent finish was named for the northern lights which it mimics. As with any coating, the finish may be scratched or wear off.